Recently a local group came to me asking me about creating a Facebook account for their organization. This group recently attended a workshop on social media. I mentioned creating a page for the business. To my surprise they never heard about a fanpage or page at the local workshop. So whats the difference and why is knowing the difference important? Why does this matter? More and more people are creating profile pages for their business. You've probably gotten a few requests to be friends with a business and you've probably accepted them, for now (we'll get into this more later). So what happens if you violate the terms of service? Your profile will be deleted by Facebook. Whether this is a big deal or not, Facebook won't care because you broke their rules and after all, you are playing in their playing field and as such, must abide by those rules. For some people with a couple friends on their businesses personal profile, this might not be a big deal. While writing this article I polled a business who has a personal page for their business. They spend upwards of 10 hours a week working on their personal Facebook profile. Now 10 hours a week is a lot and they would be considered on the high side of average. This company does has a good amount of friends but what they don't realize is they're putting themselves at risk. Why? Because they have a Facebook personal account for their business and currently have 3000 friends. The maximum amount of friends one can have on their facebook profile is 5000. The moment you reach 5000 friends, you can't add anymore friends and people are unable to add you. Infact, adding high profile individuals may actually limit your own account as well. If you send a request to a stranger, it will be considered spam and your friend request will be blocked temporarily. Please only send this request if you know Ted. As such, while I may be interested in being friends with a local business that has upwards of to 5000 friends, I would also be putting my own Facebook profile account at risk. And no offense to Ted, but my Facebook account is a bit more important at keeping up to date with friends then it is to add a fellow business I may support to my friends list. So by adding a business as a friend who has a lot of friends, this could cost me my own Facebook account. But what about the business? What are the disadvantages to that business? Well, spending 10 hours a week on Facebook is a large chunk of time but at the same time, that business is serious about its online promotion. That's 1/4th of a full time employee working on the Facebook presense. So say, that full time employee spends 10 hours a week working on the Facebook presence for 1 year. 52 weeks in year, subtract 3 for vacation leaves 49. 490 hours a year spent on Facebook. Add in the employees wage and you're looking at $4,900 a year, assuming they are paid $10 an hour. Over 2 years, that would be $9,800. As an employee, all that time you spent working on the Facebook presence is gone down the drain. Why? Because of the sections mentions at the first of this article. Facebook Personal Profiles are exactly that. All the time you spent promoting your business ruined, as well as the thousands of fans you may have had are gone. People will kick and scream and cry bloody murder. Similar situation happens with Paypal on a frequent basis. People fail to abide by the terms of service and as a result, their accounts are suspended and that money promoting yourself is gone down the drain and so isn't the reputation points you received by doing more and more transactions on Paypal. I have heard of companies doing tens of thousands of dollars through Paypal and their accounts were suspended due to terms of service violation. When I was doing similar sales through Paypal with my previous company, I made sure I knew the terms of service inside and out. When your business relies on another business you should make sure you know the terms of service or else it is bad management. I know I didn't want to risk loosing my hard earned money through Paypal because I messed up with the TOS. Nor do you. Now I'm sure your saying, great we get the point. Facebook TOS means account suspension or removal. 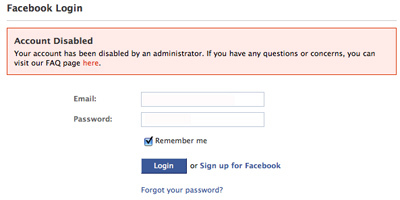 What about the other downsides to using Facebook profiles instead of fanpages? Fanpage status updates tend to stay in the news feed a bit longer or are more prominent. I assume this is because of some sort of Facebook algorithm. Facebook profiles take longer to maintain. Adding or accepting friends might take a second to add someone new each time. With a fanpage, your fans will automatically have access to be your fan without you ever approving them. More importantly, search engine optimization is a big thing with Fanpages. Let's take my morriscode Fanpage. 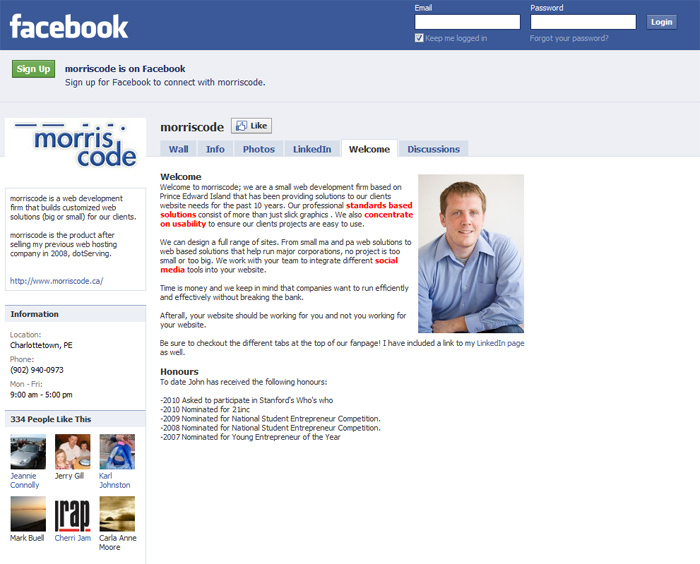 You google â€œFacebook morriscodeâ€ and view the non-logged inversion, you will see Google being able to index every page on the Fanpage. As you can see, every link you can click on and view more information on the specific fanpage. 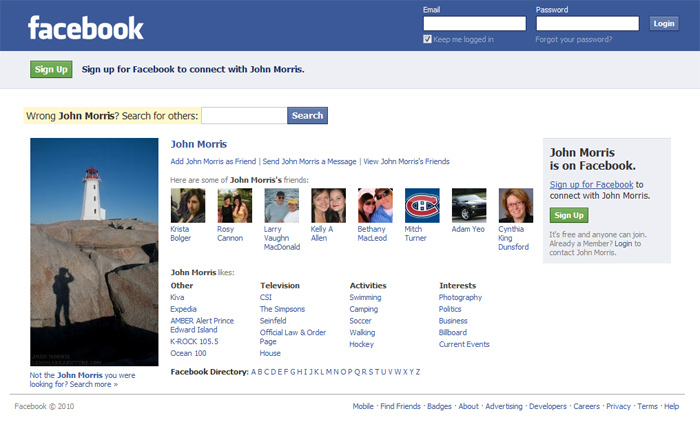 Try Googling â€œFacebook John Morris PEIâ€ and you will see you can only see a very limited amount of information about me. Same goes with "Ted Leonsis". 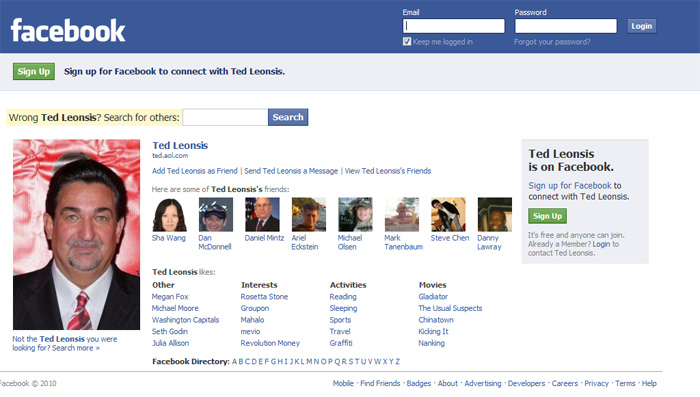 Try googling "Facebook Ted Leonsisâ€. You will see a very limited amount of information even though his Facebook profile privacy settings show his profile as open. With Facebook fanpages, you can send a message out to all your fans all at once. When it comes to a Facebook profile, you can message up to 20 fans. Some companies will create events to be able to message the masses but when your event only had 30-40 attendees, you're not hitting the thousands of fans you could be sending your message too. The last thing you want is to create a massive list of friends, who are interested in your business and not be able to have access to send them messages. Sure you can send out status updates but we all know having one on one communications via a messaging system works much better.